Meet “renegade researcher” Nance Klehm. She’s on a mission to transform our thinking about waste—and to transform our waste into healthy soil. I first met Nance at last October’s Radical Mycology Convergence, which she hosted on her rural land in Illinois. She divides her time between rural and urban—growing native trees, plants, and mushrooms on her land, and nurturing innovative community projects in Chicago. As a fifth generation horticulturist, she has a passion for working in partnership with nature and enjoying the abundance that results. She has worked on graywater systems, humanure, and soil fertility for years, both in the U.S. and abroad. She was even invited to Haiti to assist with composting toilets after the devastating 2010 earthquake. She works on composting policy at the state and local level, and teaches “Composting 401” to people who really want to get down and dirty. “When people say, ‘what’s possible?’ I’ve done it,” she told me. “I have photographs and data and anecdotal experience from living in Chicago for 25 years.” She envisions a widespread scale-up of composting efforts that would shift how cities handle sanitation. 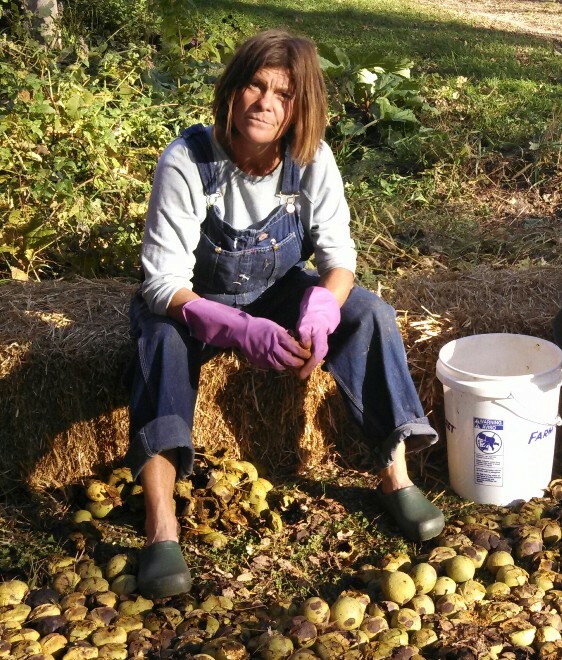 Nance removing husks from walnuts grown in her food forest. Recently she was the featured guest on the Root Simple Podcast, talking about her work with community bioremediation in Chicago. The project, called The Ground Rules, has multiple community-run soil centers working on bioremediation. Urban soils are often contaminated with heavy metals and other toxins. Klehm and her volunteers are addressing this problem by diverting waste into compost. By bicycle and truck, they pick up discards from restaurants and businesses: uneaten food, vegetable trimmings, and paper towels, for example. Nearby soil centers are where they convert this “slop” into a high-powered soil amendment. “It’s crazy fun to work with food slop,” Nance says. The waste is kept local, put to work in service of the longterm goal of remediating the soil. 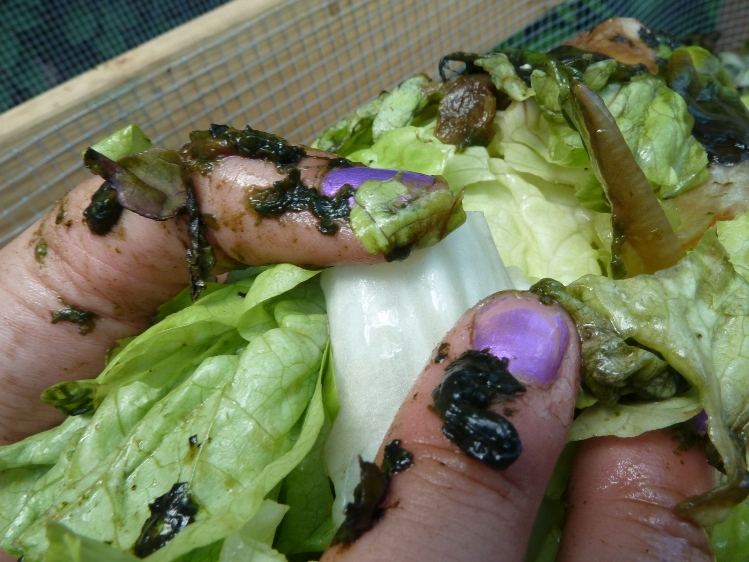 Bacteria in the compost help to break down inorganic chemicals. The teams also use plants and fungi to help with this goal. So, four biological kingdoms—animal, bacterial, fungal, and plant—partner in this vision. The Ground Rules from nance klehm on Vimeo. Currently she’s writing a manual for others interested in community bioremediation. She blends practical, technical information with anecdotes from the soil centers, because they are all different. Each site has its own issues and challenges. Nance says the social component of this work is the trickiest part, so it’s important to address that along with the how-to aspect. She’s running a crowdfunding campaign to support this important work. Any small amount helps. And of course, if you’re in Chicago, consider volunteering. If you want to hang with fun and funky folks while learning a whole bucketload about advanced composting, she would welcome you, I’m sure! Update: For more on The Ground Rules project, check out my Acres USA profile of Nance Klehm.